Sometimes we feel we need to do so many things for God. We may start to think that without us, many things would not be done. People need to be saved, others need to be counseled, still others need help from us. This was the problem of Martha who was working in the kitchen. She had been working very hard to make Jesus feel welcomed in her home. She’s the sort of person who cannot sit down and must always be working because there is always someone to take care of – whether its her brother Lazarus or her younger sister Mary or Jesus or some other guest. Certainly, there is nothing evil or bad about Martha. She’s doing her very best thinking that that her very best is what the Lord wants of her. But Jesus will give her a lesson in humility. Its not what Martha can do for Jesus or for God or for anyone that matters. What really matters is what Jesus can do for her. And this is what Mary had allow Jesus to do. 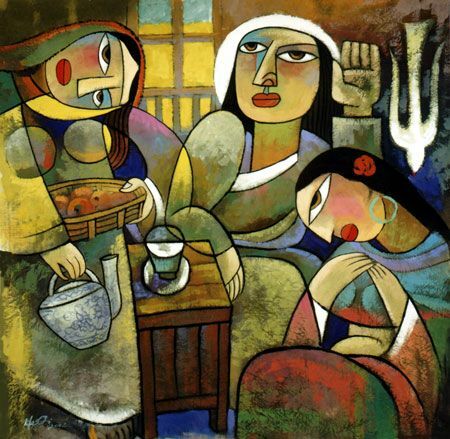 Mary sat at the feet of Jesus – seemingly useless and doing nothing. But she was actually allowing Jesus to be Jesus – Jesus the Teacher, Jesus the Guide, Jesus her Lord. This was also the experience of Abraham in the first reading. Abraham thought that he was extending hospitality to these three men, not knowing that God was in his midst. He thought that he was doing his guests a favour by his overwhelming hospitality, but it would be his guest, God in actual fact, who would be doing that favour for him. Abraham, who had been childless for so many years, would now have a child – a gift from God. We must always remember that God invites us to participate in his work of salvation. What ever our contribution, it is always still God’s work – not ours. We must not begin to delude ourselves that we should take credit for all the people that we’ve helped. People are helped precisely because God has chosen to use us as his instruments to help them. If we fail to recognize this or if we fail to recognize the difference between the instrument and the One who uses the instrument, then we will be building our own kingdom rather than God’s kingdom. And this kingdom of ours will easily crumble when we encounter failure, or setbacks or criticisms. But if it is God’s kingdom that we are helping to build, we know that the work will continue in spite of our own personal failure. God keeps on working even when we give up. God never fails even if we think we have failed. This is the reason why Paul can speak with such hope and joy even in the midst of suffering and personal failure. He writes the letter to the Colossians when he is in jail. He will soon be sent to Rome where he will meet his death. Paul can speak with hope and joy because he realizes that he is only a servant of the Church and of God. Paul understands that he is only one small piece in that whole plan of God for the salvation of mankind. He is confident that even with his arrest and his death, the mission and work of God will continue through the ages. God keeps on working even when our work seems to have come to an end. Let us praise God and gives thanks to him. Let us continue to place our trust and our hope in him because he is the source of our strength. Let us always remember that it is his kingdom that we are building – not our own. With this hope, we shall never be afraid of failing because God will never fail – his kingdom will be established. Jesus has already won us salvation.